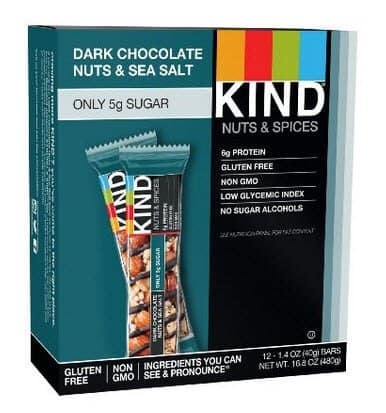 KIND Bars, Dark Chocolate Nuts & Sea Salt bars are a little sweet, a little savory and completely gluten-free. While dark chocolate make these sweet enough to be had for a dessert after lunch, the sea salt balances them so they also make a good in between meal snack. With only 5 grams of sugar per bar and 6 grams of protein, these offer superior nutrition to most traditional candy bars. They also do not contain artificial ingredients, sweeteners or sugar alcohols, unlike most protein bars. A single bar also provides 7 grams of fiber which is 28% of your daily recommended value, all conveniently packed into one bar that you can easily eat on the go. The fiber keeps the net carbs to 9 grams per bar, making them a good option to use along with several popular diets. They are low glycemic value along with protein can help keep your blood sugar level and may be an option for those suffering from blood sugar control. Each 1.4-ounce bar contains no gluten and the soy used is certified GMO-free. Whole nuts and seeds drizzled with rich dark chocolate and sprinkled with sea salt round out this treat that is as decadent as it is healthy. The whole nuts give this bar an extremely crunchy texture. Each bar is individually wrapped so they can be taken anywhere you need a healthy, gluten-free snack. Sweet and savory Mix of almonds, walnuts and peanuts drizzled in dark chocolate and a sprinkle of sea salt. Only 5 grams of sugar per bar. Each bar is individually wrapped. Some reviewers do disagree with using them as a meal replacement since they are not an overly large bar but are still good for in between meals or as a not too sweet dessert. However, these do have a higher protein and fiber content compared to other KIND bars and could be a nutritionally sound meal replacer if you are so inclined. The low sugar content makes them a better snack option for those with blood sugar issues like hypoglycemia. Nutritionist Lauren Kelly of https://Laurenkellynutrition.com says “…I recommend eating these bars when you are on the go and need a quick, healthy snack. I love that they are Non-GMO, gluten-free, vegetarian (some are vegan) and relatively low in sugar…” Making them a tasty but also healthy choice compared to many bars on the market that are loaded with artificial sugars and ingredients. Because of this, the bars are not overly sweet making them more satisfying and less of a strict dessert type of snack.